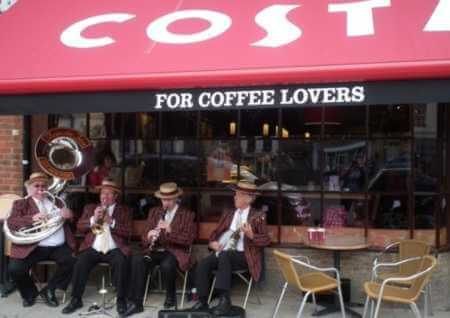 Jazz Band for Corporate Events, Live Corporate Entertainment. This jazz band are a quartet of professional musicians that are used to providing live corporate entertainment that are available to bring their smart professionalism to your corporate event. 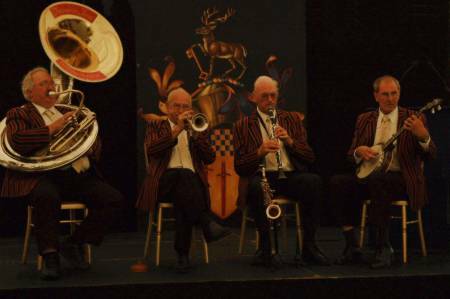 This jazz band has been established over twenty years providing good quality musical entertainment at many company events, through out Hampshire, Dorset, Sussex, Surrey, Wiltshire and Berkshire. The musicians play a mixture of the popular tunes, blues & ballads written in the early 20th century played by this jazz band in the traditional jazz style, which appeals to a wide audience. 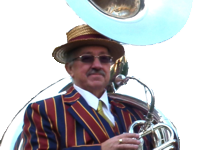 Acoustic Jass use Trumpet, Clarinet, Banjo and Sousaphone which makes them very versatile as they are not dependent on electricity thus are able to move from place to place between tunes. Please note Acoustic Jass has a regular line up of players, unlike some other jazz bands, they never take a booking and then provide a substitute band, what you book is what you get, see the Frequently Asked Questions page. This jazz quartet for corporate events provides a polished professional performance tailored to the bookers requirements. 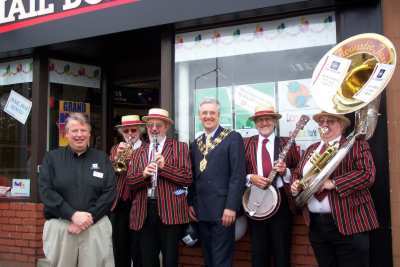 Acoustic Jass are available to create a friendly rapport with the audience, and give good value entertainment any time of the day, any day of the week.